Krista wanted Green Bean Casserole at Thanksgiving. Nolan and I loved the left overs. Recipe from Happy Herbivore Holidays and Gatherings. Line a large skillet with a thin layer of broth and sauté the onion and garlic over high heat until onion is translucent, about a min. Reduce heat to med and add the remaining broth, mushrooms, green beans, poultry seasoning, mustard,thyme, sage and a dash of nutmeg. Stir to coat the mushrooms with seasonings. Cook until mushrooms are soft and green beans are cooked but still crisp, about 7 min. Meanwhile, in a small bowl, whisk nondairy milk with nutritional yeast and cornstarch. 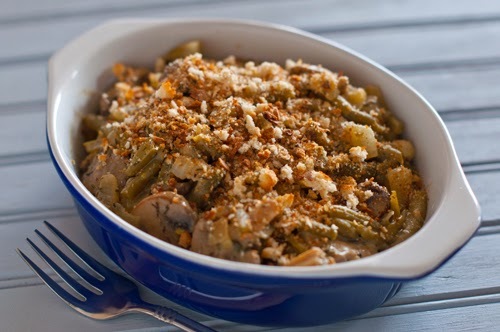 Once green beans and mushrooms are cooked, pour in the nondairy milk mixture. Once it thickens slightly, turn off heat. Add salt and pepper to taste. Top with dried onions, bread crumbs whatever. A Verse to pray over each member of our family. Our family...Our faces...Our stories....Please do not borrow without permission.